"Its been a difficult and grueling weekend for the residents of Andover, North Andover and Lawrence," Massachusetts Gov. Charlie Baker said on Sunday. Thousands of people were allowed to return to their homes in Massachusetts on Sunday after a gas leak that set off dozens of house fires, killing one and injuring 25. 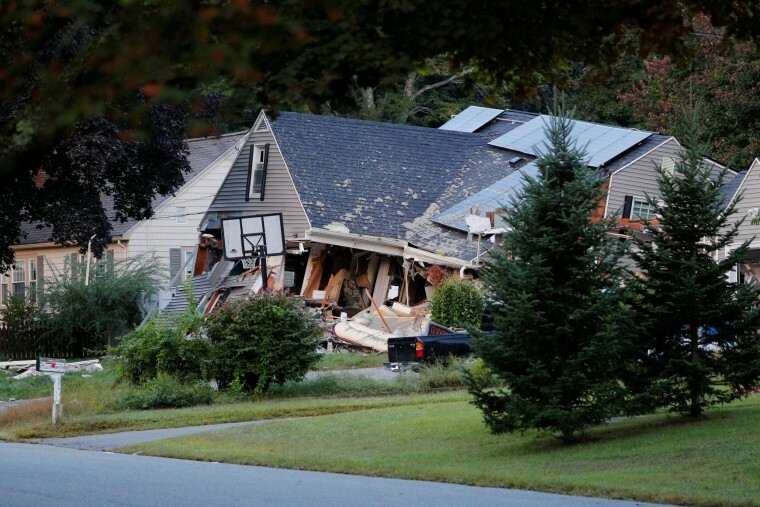 On Sunday morning, the Massachusetts Emergency Management Agency and public safety officials gave residents of Andover, North Andover and Lawrence the all-clear to return to their houses. Nearly 8,600 affected gas meters had been turned off and approximately 15,000 power outages have been restored, according to officials. "Its been a difficult and grueling weekend for the residents of Andover, North Andover and Lawrence. I often say the people of Massachusetts are resilient and this devastating situation is no exception," said Massachusetts Gov. Charlie Baker at a press conference on Sunday morning. Baker said as of 6:30 a.m. ET, all homes in the affected area had been cleared of gas, although the city of Lawrence urged residents not to return to their houses until 7 a.m. ET. On Sunday afternoon, Robert Sumwalt, chairman of the National Transportation Safety Board, said the agency had determined the explosion had been caused by an over pressure situation. There are 14 regulators in the area where the gas explosion occurred, Sumwalt said. Those regulators receive gas at 75 PSI and are supposed to reduce the pressure flowing out to .5 PSI. Sumwalt said if the pressure gets too low, it can cause outages, which is why so much gas flows to a regulator. The regulators have a sensor for when the pressure gets too low, and will release more gas to compensate. Sumwalt said on Sunday the NTSB discovered evidence that a pressure sensor was attached to a gas line that was being capped and taken out of service on Thursday. Sumwalt said now investigators must determine if that sensor is what led to the over pressure situation and why the sensor was attached to the soon-to-be-retired gas line. "Gas is supposed to flow to their customers at about one-half PSI. We believe gas did indeed flow into homes at significantly greater flow-rate and pressure," Sumwalt said. "The real question for this investigation is to answer why this occurred." Public safety officials said the next steps in the recovery process would include assessing the damage to the low pressure gas system and technicians inspecting all gas equipment. “I want to commend the teams of police officers, firefighters and utility workers who worked diligently to meet this morning’s goal of reopening all homes in town to residents,” Andover Town Manager Andrew P. Flanagan said in a statement on Sunday. Three separate explosions around 4:15 p.m. ET on Thursday caused as many as 80 homes to be burned or damaged, according to officials. "The explosions that occurred Thursday night have brought heartbreak for numerous families and the loss of one young life," Baker said on Sunday. Leonel Robson, 18, of Lawrence, Mass., was killed when a chimney from a house explosion in Lawrence fell on the car he was in, officials said. The explosions and fires initially mystified officials. Baker said at the time the state would work with the federal government to investigate what happened and who should be held accountable. On Saturday, federal investigators said there didn't appear to been anything intentional behind the blasts. The NTSB said on Saturday that it planned on looking into how Columbia Gas of Massachusetts, whose pipelines set off Thursday's explosions in Lawrence, Andover and North Andover, kept records and how its procedures operated, according to Sumwalt. They also plan to take a closer look into recent complaints from the utility's customers, Sumwalt said. Joe Hamrock, chief executive officer of NiSource, parent company of Columbia gas, said on Sunday that the company is "taking full responsibility for whatever the NTSB findings may be," according to NBC News affiliate NECN. As residents returned to their homes, Columbia Gas urged people not to turn their gas back on. "Now that most residents are back in their homes, our crews will work to restore gas service. This could take weeks. DO NOT turn your gas back on," the company tweeted. Schools in Andover and North Andover were scheduled to reopen on Monday. However, in Lawrence, schools would remain closed on Monday due to officials needing more time to restore gas and electricity. At least a dozen families in Lawrence have been permanently displaced by the gas leak, according to a press release. Lawrence Mayor Daniel Rivera said a relief fund for those affected by the gas leak had raised $100,000 as of Sunday morning. As residents returned home, a three alarm fire occurred in Lawrence, but it was later determined that the fire was not in the affected area and was unrelated to the gas explosion.